The white watch worn by Sandra Bullock' character in "The Blind Side," featured a rotating diamanté bezel encrusted with numerous stones of mineral glass set against a pristine dial with diamante hour markers and a butterfly clasp that fastened the plasteramic strap securely. After the film won the Best Actress Award for Bullock, women all over wanted that same ToyWatch time piece. While a black watch reeks of mystery and power, a womens white watch can best be described as subtle sophistication. A woman who wears a white watch comes across as fresh-smelling and neat-looking. Some women are content to declare their independence, intelligence, fashion savvy, and life choices with a low profile. 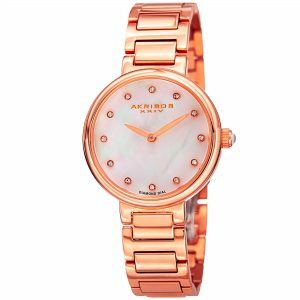 The Escada Women's Swiss Lauren Diamond Accent White Ceramic and Stainless Steel Bracelet Watch has a luxurious finish to a 36mm case that displays a mother-of-pearl white dial livened up with an applied logo, silver tone hands, and diamond markers. Water resistant for up to 30m, this watch has a bracelet of stainless steel with advanced buckle deployment and white ceramic links. If you prefer to go digital, there's the Versus by Versace Hollywood Watch Collection featuring a stainless steel round case of 41mm, a maze designed-white strap in rubber, a LED display, maze designed-digital dial in silver tone, a military/standard time option, and quartz movement with a 30-meter water resistance. The 88 Rue du Rhone is the most expensive in this list, featuring a leather strap with the white texture of an alligator, a 35mm stainless steel round case with an embellishment of 88 diamond accents, luminous logo and silver tone hands, and a motif of 88 lacework on its white dial. The 88 Rue du Rhone, with water resistance of up to 50 meters and Swiss quartz movement, is the dress watch. 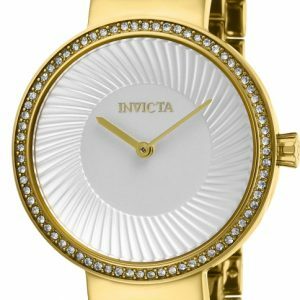 Another good white womens watch is the Vince Camuto Women's White Croco-Pattern with partially-padded crocrograin-patterned white leather strap, a 42mm silver tone, round case of mixed metal and a Swarovski crystallized bezel. 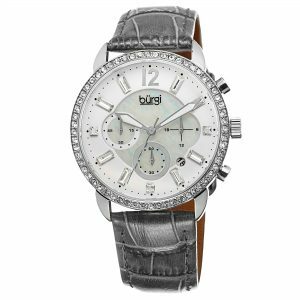 With three sub-dials, Swarovski elements, Roman numerals in a multifunction silver tone dial, it has a five year (limited) warranty for you to enjoy wearing. The Wenger Women’s Swiss Squadron Lady White Silicone watch is for the sporty woman with its durable rubber silicone white strap, a 36mm stainless steel round case, bezel markers, a screw-in back case, and a glass face of sapphire crystal. Water resistant up to 100m, this Wenger's dial is made of mother-of-pearl, luminous blue numerals, date window, and silver tone hands. Stylish and modern, the Caravelle New York is a women's chronograph watch by Bulova. In polished white ceramic, it has a chronograph dial, powered by quartz movement, in white and clear enamel, a bracelet in white ceramic, three sud-dials, a logo, three hands, and silver tone numerals. With a two-year limited warranty and 30mm-water resistance, what more can you want in a watch? 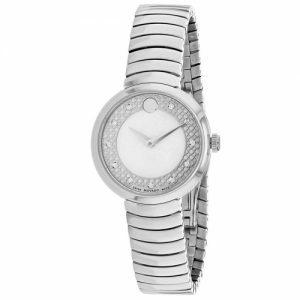 Charming is the Anne Klein's Women's White Ceramic Bangle Bracelet Watch by Anne Klein. With a 31mm-mixed metal round case, this unique white ceramic bangle watch has a jewelry closure clasp and Swarovski elements surrounding the white dial. It also has a sweeping second hand, silver tone markers, two hands, and quartz movement to round up its set of refreshing features. Art Deco is exquisitely crafted in this Fendi time piece with a bracelet of stainless steel, silver tone white ceramic in a square case with diamond accents. The white square dial has stick indices, logo, and a date window. The watch also has 50m-water resistance, a two-year manufacturer's warranty and logo. This Fendi is perfect for the woman who wants style and functionality in just one watch. A watch is an ubiquitous gift, yet it is one of the most meaningful that you can give to a loved one. Of course everyone will be appreciative to have a time piece that is not only functional but stylish as well. You have to consider, however, the preferences and tastes of the recipients of your gifts. Your recipients will be glad to receive your gift but they will be happier to get what they really want. Get a stunning look everyday for work and perfect poise even while at a mall with a white watch. There are new styles made of various materials available for the kind of lifestyle you have and your personal preferences. From simply-designed glass faces made of durable mineral crystals to mother-of-pearl dials to silicone straps to ceramic bangles, make your next watch choice a white one. You can choose from among time pieces in categories such as luxury, trendy, sporty, edgy, and wacky styles. But be aware of the differences in prices and don't go way over ahead just because one watch looks cuter than another only to find out that the price tag exceeds your budget. And while you're at it, consider giving yourself the gift of a good quality watch. A good quality white watch is more than an attractive accessory. 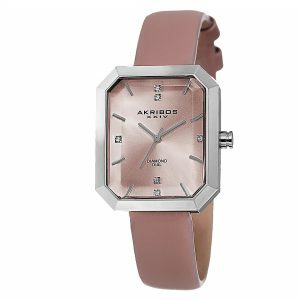 The finishing touch on any well-groomed woman beyond the polished shoes and the tailored suit is definitely a good watch. Additionally, white womens watches are a wise investment. Save up for one to get what you really want. Just make sure it's something unique, within your budget, and one that you will be proud to wear. i love this review, they are really great watches! check out this watch though, its even waterproof!